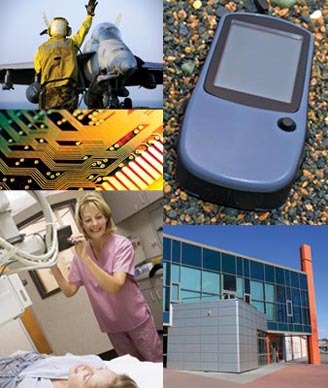 Demanding markets we serve include, clockwise from upper left: military and defense; electronic equipment; outdoor commercial and residential products; medical imaging, and; printed circuit boards. From super-thin coatings on delicate electronic components to detection-evading Bunker Buster missile paint, Qualicoat is primed to meet your customers’ most stringent requirements. To discuss the best pretreatment, coating and graphic materials and technologies for your particular project, please contact us at (585) 293-2650 or info@qualicoat.com.